Christmastide looms once more…it feels as though I only took the decorations down last week. The December 2013 Newsletter included a sort of puzzle, but as there were only two reactions, this will not be repeated. Instead, an extended array of pictures is presented for your delectation, and one or two reports from you, the Members. I'm entitling this superb photo from Howard, Beauty and the Beast! Its quality is such that it can be zoomed up to show quite fine detail. All-British iron, on an outing to France, in the early twenties, I think. Can anyone add more? Thanks again to Howard, for another fine shot, probably also in France. He thinks that no. 30, on the left, is a Gnome et Rhone. Note that it is fitted with a rear brake at the front. No. 34, on the right, (a Douglas?) wasn't taking chances either, with a disc brake! A RIDER'S FIRST EVENT ON HIS NEW BIKE, WITH IMPRESSIONS! After having the magneto rebuilt, I was able to paddle-start in second gear, which came as quite a pleasant surprise. It reduces the need for a kickstart, but I will still try to make one. Day 1 of the Rally. This day was hot! There were about 40 bikes on the rally, which had a cut-off date of 1939. We did a short run of 40 km., just as a shake-down. The bike started easily and off I went, after forgetting to prime the oil pump. However, manual pumping did the trick. The handling was peculiar, it felt that it wanted to wander all over the road, but I soon found that I was over-correcting, and that in fact all I needed to do was ride with a light touch on the bars for it to go precisely where I wanted. The engine ran sweetly with lots of power. I held it down to about 60 km/h., and all went well. Distance, 150 km. It was wet: must have known the ABC was English! It started easily, and this time I waited for the pump to prime, and it worked. So off we went. The handling was good, but the gear-box tended to jump out of top gear, so I took to holding the lever in with my leg. This worked OK, but as soon as I moved, it jumped out again. The noise from the transmission was quite loud, but everyone else thought that it sounded sweet, so I concluded that this noise is reflected off the under-panel and leg shields. After about 120 km. it started to stutter and lose power. I stopped, and immediately realised that the RH exhaust valve was stuck, a direct advantage of being able to see the works! Anyway, that was the end of Day 2: into the sweep-truck, and back to base, where I pulled the head off, and found that the valve had picked up on its guide. A bit of emery cloth soon fixed it: back together with lots of lube, ready for the next day. Distance, 140 km. 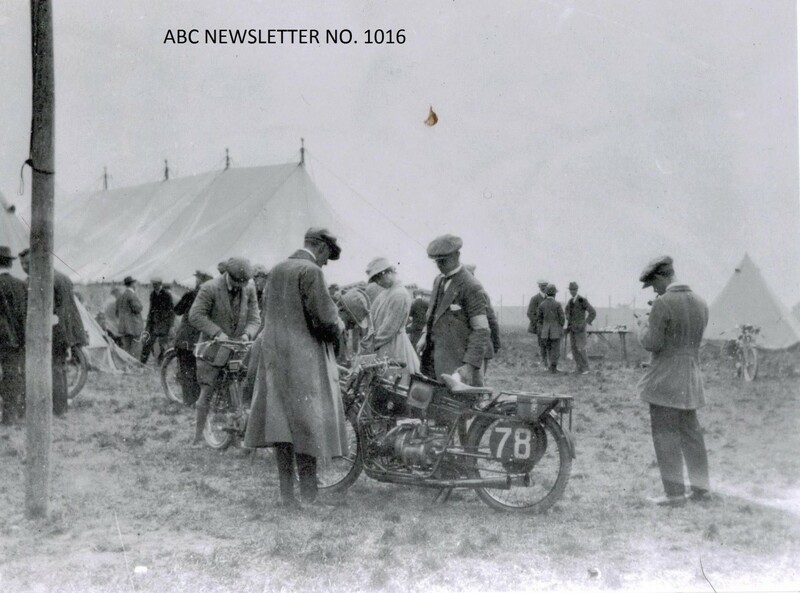 It was dry and sunny, and everyone was surprised that the ABC was running again. I now have a better feel for the bike, and all is looking good, even if the lubrication seems a bit hit and miss, although it works OK. The suspension is excellent, and is the envy of most of the other riders! The front brake is hardly enough to stop the bike rolling in the carpark but the rear brake is first class. The engine was running well, so I increased the cruising speed to 70-75 km/h, with a short burst to 90: no problems, and there was still plenty left. There was one very steep hill where I dropped to third gear, and drove up it easily. In front was a 1200 Harley that kept getting in the way, so we despatched him to the rear mirror, a la pronto. However, after completion of the rally, within walking distance of home, the gearbox made a nasty clunking noise as I changed down for a junction, and I could find no third gear. I drove the last bit in first, but after stopping, found that none of the gears were working. A preliminary inspection (through the oil-filler hole) indicated that transmission between gearbox sprocket and small bevel gear has been lost. Is there a key in there that could have sheared? For a bike of unknown provenance and history, it performed well! The engine is a peach, the gear box is - umm - different, though manageable. The suspension is wonderful. Brakes: well, the rear one works. Summing up, Why is it that more people don't ride their ABCs? They are great! Years ahead of their time, and Granville Bradshaw certainly knew a thing or two about bikes, Flawed Genius or not! Andrew Cox and Sopwith ABC. The lost transmission has subsequently been traced to heavily damaged bevel gears, in turn tagged to an unlocked bevel-box adjustment ring, that unscrewed itself in the course of the rally. Really, the pegged lockplate is not just an embellishment (see Newsletter No. 1005 for an illustration), but a very important component. Hmmm…Christmas approaches…can anyone help Andrew with a pair of bevels? Does this one look familiar? Try Newsletter No. 1011: yes, it's our old friend Reg Lucas' bike, racing no. 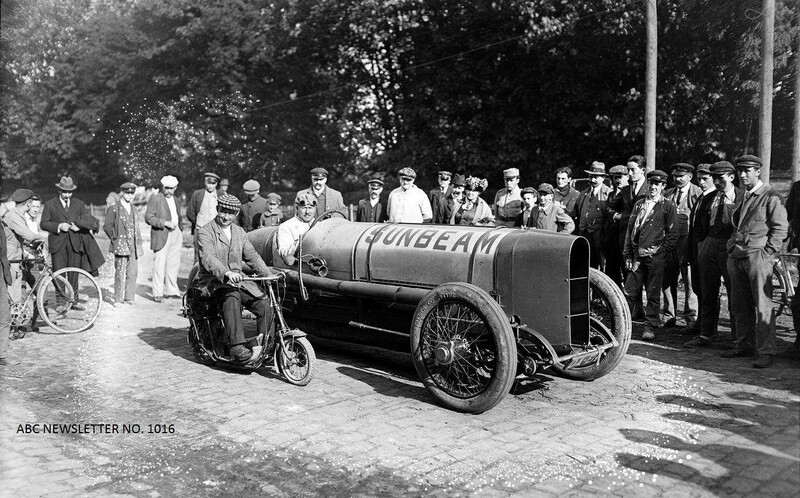 78 in the 1920 TT, this time being inspected in the paddock, although whether it was pre- or post-race is not clear. Thanks to Keith for another classic photo. Just to balance things up, a Technical Tip, of a sort. Although I'm still not sure that Sopwiths ever left the factory equipped with chain guards, it's clearly not a bad idea to fit one. 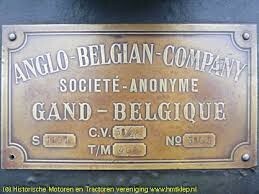 Aha, but where does one find a suitable 'guard? The answer is, on a bicycle! It simply needs reversing, end to end, and from right to left! A possible problem is width: most ABCs are fitted with a 3/8" chain, so that the clearance could be low. The other matter is the method of mounting. I would recommend a rigid fixing at both ends: to the rear frame at the back, and to a bracket from the mudguard at the front. There are alternatives, but they are likely to require pivoted attachments. 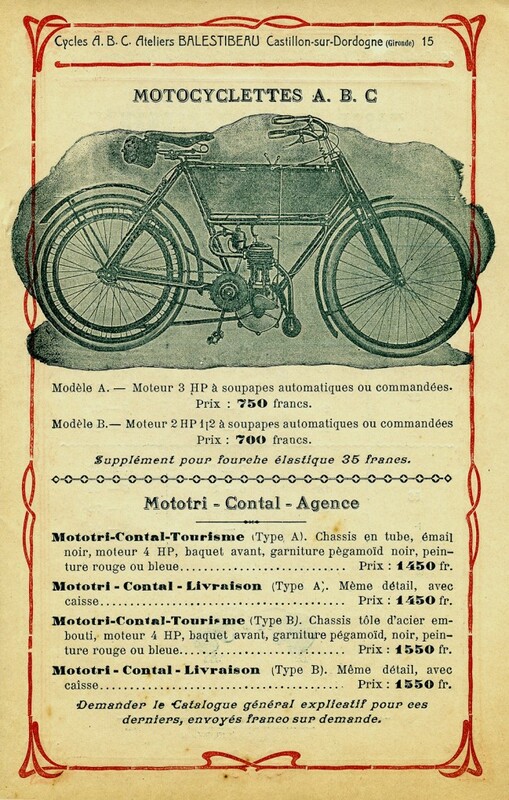 …and this one (from the Ateliers Balestibeau Castillon) apparently made a modest range of motorbikes in about 1905. Their engines were reportedly from Zedel or Amstoutz, names one rarely encounters today. A footnote, about the Sopwith due for auction at the Stafford Show in October, mentioned in Newsletter No. 1013: it went for five bob less than six grand! One wonders if the new owner of PC 1033 will join our Association at some future date. To wind up this December Newsletter, may I wish all you and yours a thoroughly pleasant Christmas, and an in-all-respects-positive New Year!